The only remaining buildings in Armero, Colombia, 72 km dowstream from Nevado del Ruiz volcano, destroyed and partially buried by lahars on November 13, 1985. 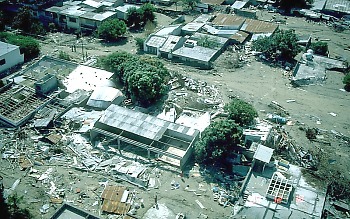 Lahars reached Armero about 2.5 hours after an explosive eruption sent hot pyroclastic flows across the volcano's broad ice- and snow-covered summit area. Although flow depths in Armero ranged only from 2 to 5 m, three quarters of its 28,700 inhabitants perished.